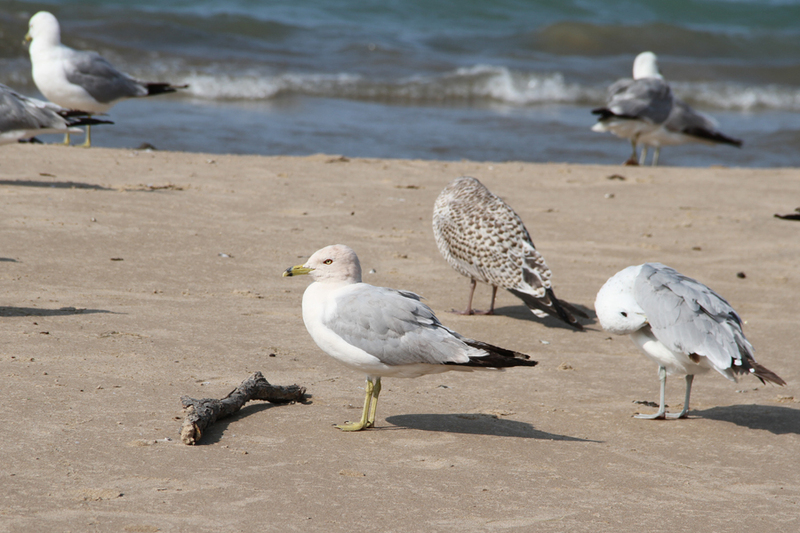 On a regular basis, and mostly during the spring and summer months, Ring-billed Gulls with a pinkish or grayish wash over their plumage, most noticeably on the normally white parts, show up in the Chicago area. Sometimes this pink or gray coloration is visible on other parts of the bird. In a few cases it appears that the gray coloration arises because the bird got into some oil, and the oil is discoloring the bird's appearance. However, most of the time, the very even nature of the coloration suggests that the effect comes from pigmentation within the feathers themselves. Below is a collection of photographs of several of these birds. 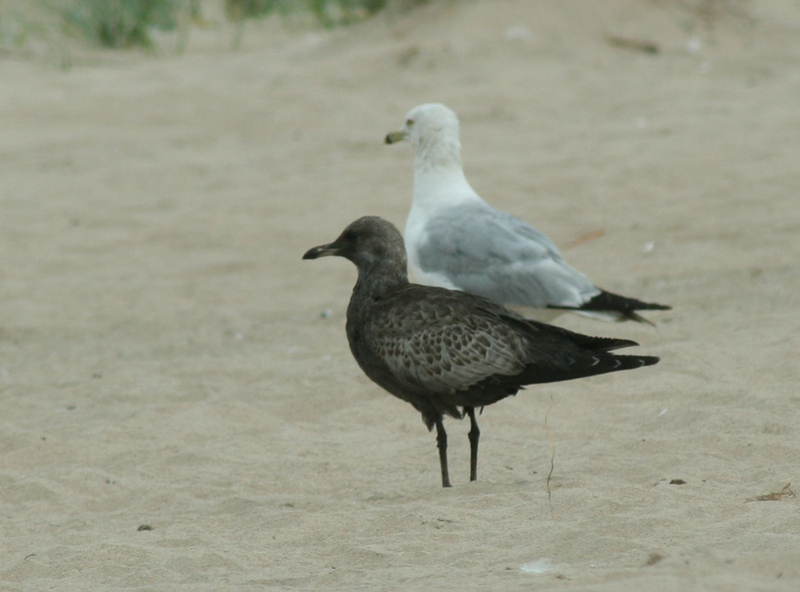 The first three photographs show one such bird observed by Wouter Faveyts on 29 April 2005 at Chicago's Northerly Island. Wouter is from Belgium and was visiting the Chicago area at the time. 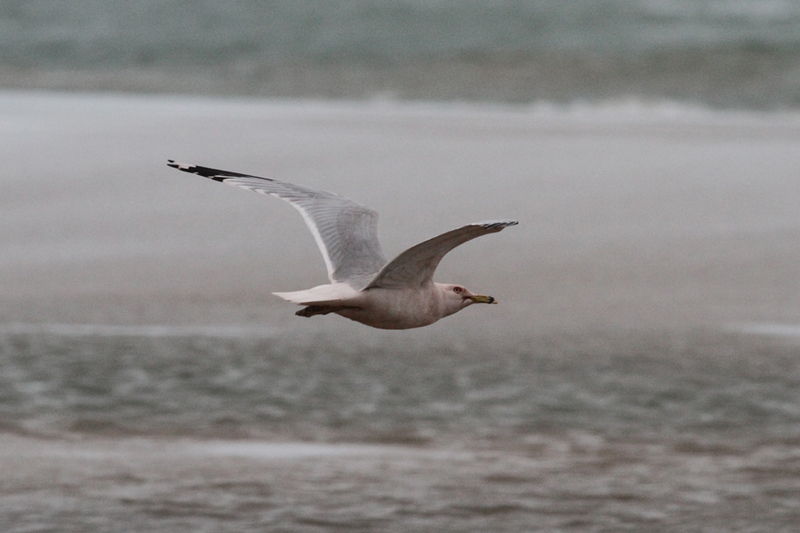 With birds like this, shape and structure can be valuable clues to the bird's identity. 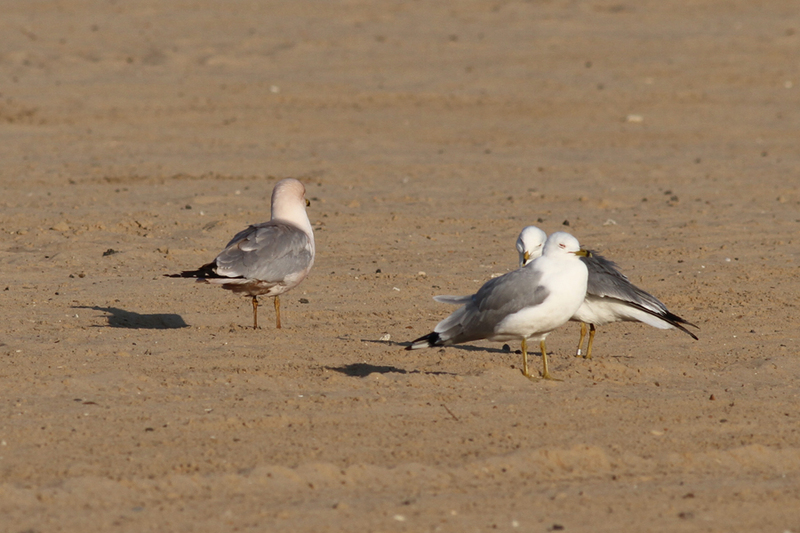 Compare the gray Ring-billed Gull to its "normal" neighbor. 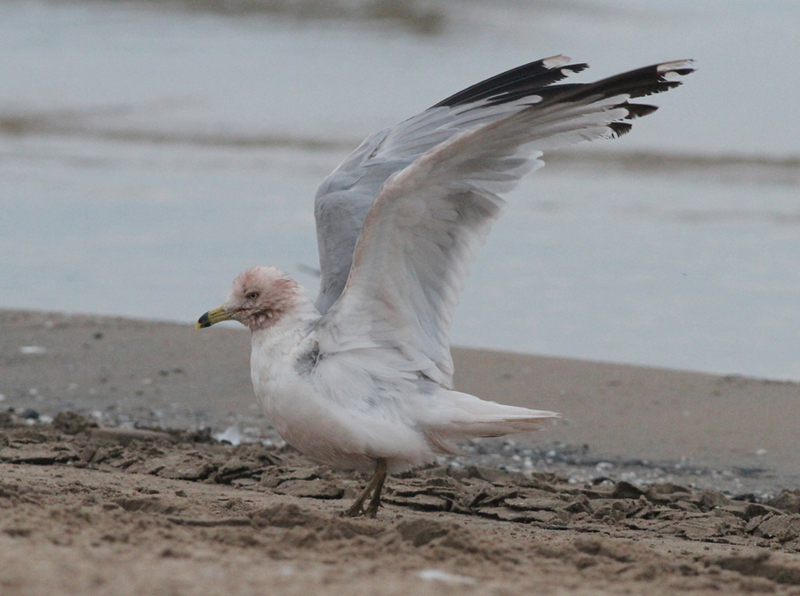 Here's a more heavily soiled individual, a first year bird, that Tim Wallace photographed on 24 July 2007 at the Waukegan beach (Lake County, Illinois). In this instance, it appears possible that the bird got into some substance. 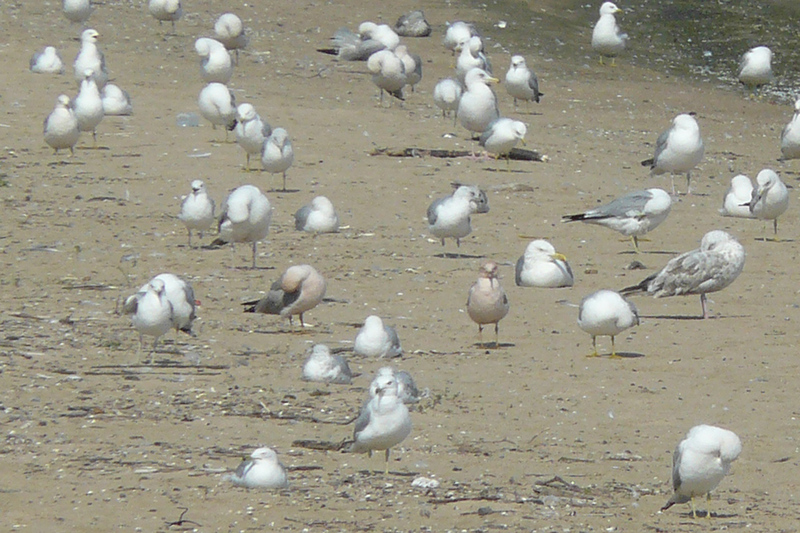 On 21 July 2012, I observed two pink-washed individuals among the the gull flock on Montrose Beach in Chicago's Lincoln Park. Another pink-washed individual that I observed on Montrose Beach was there on 29 May 2016. Another example of the pink wash is this bird that I photographed on Montrose Beach on 5 July 2016. 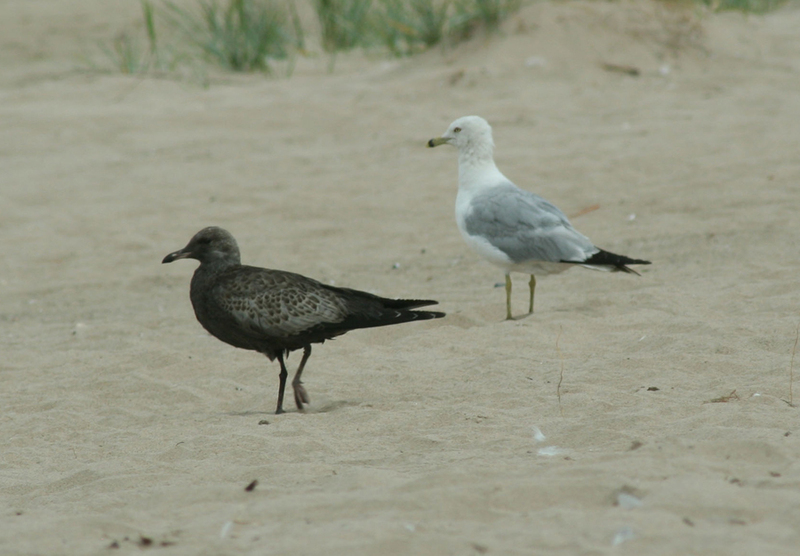 Yet one more example from Montrose Beach was present on 19 May 2017, here shown standing and in flight in photographs I took that day. 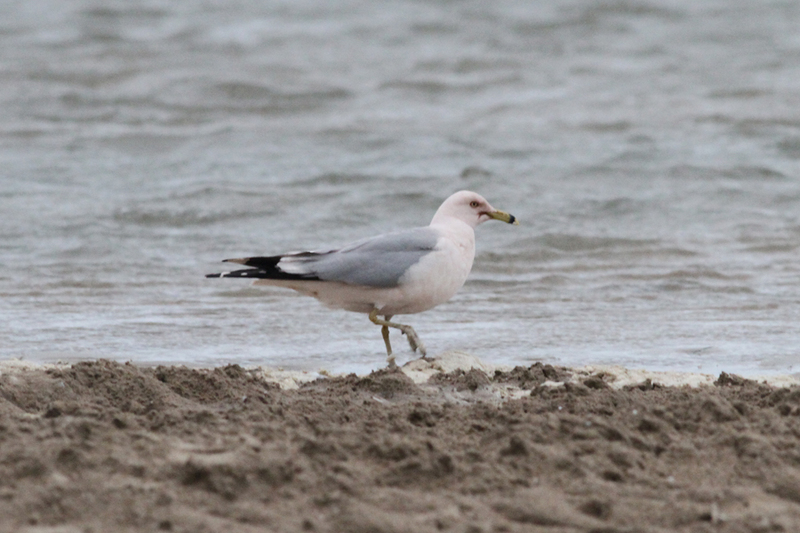 On 17 July 2017, another pink-washed Ring-billed Gull was on Montrose Beach, this one showing only a mild extent of the coloration.